A black-legged deer tick, which carries infections such as Lyme disease. In 2017, there were more than 1400 cases of Lyme disease reported by the Public Health Agency of Canada across Canada, double the number reported in 2016. The tick most likely to spread the bacteria that causes Lyme disease is the blacklegged tick or Ixodes scapulars, which in the early 1990s was most prevalent at Long Point Provincial Park. Since then, there has been a large increase in tick numbers, which have only increased year to year. Research has shown that roughly 20% of ticks in a population can carry Lyme disease, although in known hotspots 50% of the population may carry the bacteria, says da Silva. Ticks can carry and spread many other pathogens, she says, such as viruses that can cause nervous system defects. But she is quick to say this doesn’t mean we should avoid being outdoors. “Just as we do with mosquitoes, we need to exercise caution. Ticks live in wooded areas and can be found in regions with lots of leaf litter and tall grasses. So when people are out and about, it’s best to stick to the trails,” says da Silva. She also suggests keeping dogs from running too far into the woods, wearing appropriate light-coloured clothing (long sleeves and pants) which make it easier to spot a tick, and as an added precaution, using bug spray containing DEET. “Ticks can be as small as a poppy seed, so barely visible to our eyes, which makes it so important to check carefully,” she cautions. As summer-like temperatures bring ticks out of hibernation, a biologist from McMaster warns that they are spreading across Ontario, increasing the risk for infections such as Lyme disease. “During the spring and summer, ticks engage in peak feeding behaviours,” explains Rosa da Silva, an assistant professor in the School of Interdisciplinary Science and Department of Biology at McMaster. 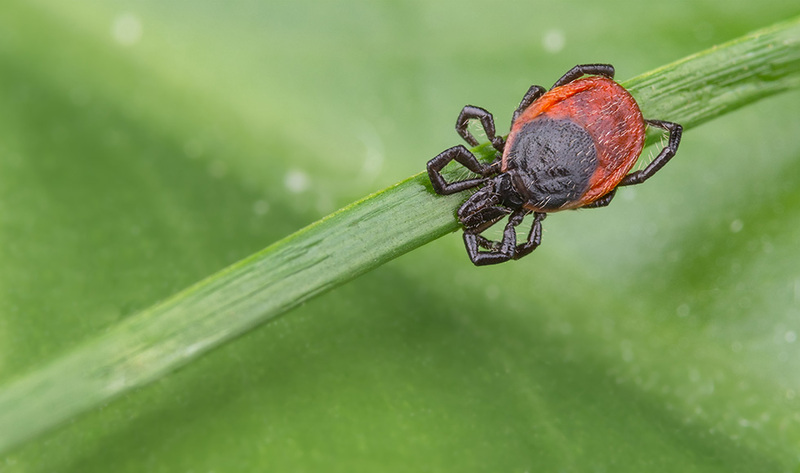 “As habitats move into more populated areas of the province, it likely means more tick bites and with that, possible cases of Lyme disease and other conditions.” In 2017, there were more than 1400 cases of Lyme disease reported by the Public Health Agency of Canada across Canada, double the number reported in 2016. https://www.youtube.com/watch?v=tTbjBq2vV2I The tick most likely to spread the bacteria that causes Lyme disease is the blacklegged tick or <em>Ixodes scapulars,</em> which in the early 1990s was most prevalent at Long Point Provincial Park. Since then, there has been a large increase in tick numbers, which have only increased year to year. Research has shown that roughly 20% of ticks in a population can carry Lyme disease, although in known hotspots 50% of the population may carry the bacteria, says da Silva. Ticks can carry and spread many other pathogens, she says, such as viruses that can cause nervous system defects. But she is quick to say this doesn’t mean we should avoid being outdoors. “Just as we do with mosquitoes, we need to exercise caution. Ticks live in wooded areas and can be found in regions with lots of leaf litter and tall grasses. So when people are out and about, it’s best to stick to the trails,” says da Silva. <strong>Read: <a href="https://www.thestar.com/news/gta/2018/06/11/lyme-disease-carrying-ticks-have-made-a-home-in-hamilton.html">Lyme disease carrying ticks have made a home in Hamilton</a></strong> She also suggests keeping dogs from running too far into the woods, wearing appropriate light-coloured clothing (long sleeves and pants) which make it easier to spot a tick, and as an added precaution, using bug spray containing DEET. “Ticks can be as small as a poppy seed, so barely visible to our eyes, which makes it so important to check carefully,” she cautions.